significant environmental harm that irresponsible four-wheel-drivers were causing in the vicinity of the Birds Road crossing of the Coomera River. He determined the careless activity to be causing extensive damage to the banks resulting in unnatural erosion, increased sediment loads and reduced water quality. 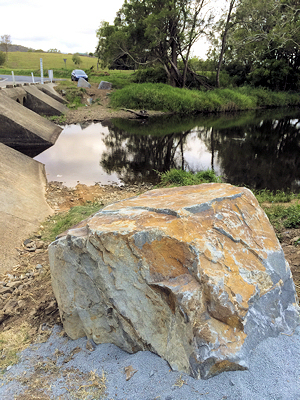 Fortunately, the resident was not only observant but environmentally aware, and appreciated that past efforts to increase the health of the Coomera River would be put at risk if the erosion was to continue unabated. With uncertainty as to the presence of platypus adding to the issue, Wildlife Queensland was contacted and was able to confirm the importance of the Coomera River to these animals also. Armed with accurate information, the resident approached the Gold Coast City Council whose members listened, investigated and took action, keeping the resident fully informed throughout the process. Large boulders were strategically placed to hinder irresponsible vehicle access to the area in the future. Wildlife Queensland congratulates the local resident and the Gold Coast City Council on their actions. The environment, our wildlife and its habitat are not the responsibility of the government alone, but of the community at large. Wildlife Queensland reports this success story with the hope of encouraging others to take similar action where needed. The story clearly demonstrates that gains for the environment can be achieved when well-informed action is taken. Wildlife Queensland acknowledges that all government bodies may not be as responsive as the Gold Coast City Council was on this occasion, but encourages community members not to be deterred in their efforts to protect and conserve the environment. Small actions may appear insignificant in themselves but the sum of all such actions will result in positive outcomes for the environment. Wildlife Queensland shares a view that the environment and its wildlife need all the assistance they can get. For more information on Wildlife Queensland’s activities, call us on +61 7 3844 0129 or send us an email.